A cairn at the old school site unveiled in 1924 commemorates the centenary celebrations of the Hume & Hovell expedition. Tuesday, 18th November will be a red-letter day in the annals of the history of Back Creek. The occasion was the unveiling of the Memorial Cairn erected in honor of the explorers, Hamilton Hume and Captain William Hilton Hovell, who passed through Back Creek on the morning of November 1824, on their journey from Lake George (N.S.W) to Port Phillip Bay. It was the published account of this journey that induced John Batman in 1834 to form the Port Phillip Association; and from that move began the colonisation of Victoria. Hume and Hovell, therefore, were not merely pioneers of Victorian exploration, the first to penetrate the region south of the Murray, and to show that it contained an immense tract of country of the best kind for settlement, but they inspired the little group of men in Tasmania to form the first settlement at Port Phillip Bay. In celebrating the centenary of the Hume and Hovell expedition, therefore, we not only recall a highly important piece of exploration which took place 100 years ago, but we also celebrate the real beginning of Victoria. 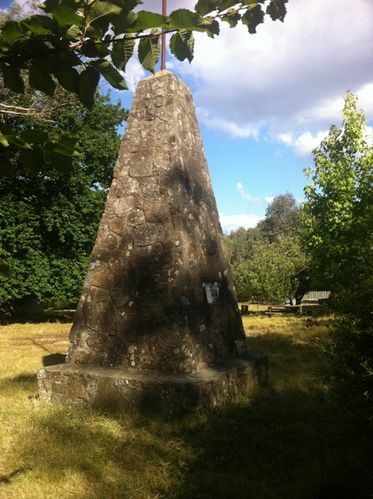 The cairn at Back Creek has been erected in the school ground which Hume and Hovell are credited with having passed through. It is a fine structure built of stone taken from the neighboring hills cemented together. It is built on a foundation base of nine feet square, has a base of six feet square, tapering into two feet square on top. It stands 38 ft. 6 in. high, has a 10 ft. flag-pole on top and is railed in with chined concrete posts. It abuts the road and can be seen by all who pass. The credit of the building of the same is due to Mr C. McCarthy who had charge of the erection of the same. The Back Creek. School Committee were responsible for the movement which resulted in the erection of such a fine cairn. They arranged for the building of same and collected the necessary funds. Embedded in the cairn are bottles containing the names of the four Schools,- Back Creek, Bauarong, Bell's Flat, and Yackandandah, who co-operated in the erection of the same, the names of the Back Creek School Committee, Teachers and Scholars, and a copy of the Yackandandah Times. Inset about five feet from the ground is a marble slab with the following inscription: — Hume and Hovell November 23rd, 1824. Erected 1924. Excerpt from Yackandandah Times, 21 November 1924.